A Group contains a set of Users. It simplifies the administration of access rights on Folders. Indeed access rights on Folders are defined by Groups. A good practice is to organize the Users Group by team or groups of interest. Notice that a User may be associated to several User Groups. Based on this assumption, Us2 is the unique user to have access to both Fdl1 and Fld2. Access to the Group Management page. The label is the name of the Group. The Required complexity corresponds to the minimum password complexity level that a User password (that belong to this Group) needs to fulfill. The new Group is now added to the list. To edit, click the edit icon. To delete, click the edit icon and Confirm. Users belonging to this Group will need to be associated to another Group. The rights matrix permits to allow or deny the access of Users in a Group to Folders. To ease its understanding, the rights matrix uses colors and icons to indicate the specific rights set for a Group on a Folder. 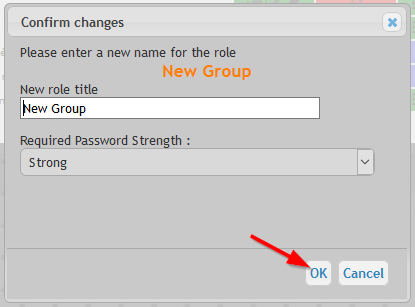 Small icons indicate the restrictions in place for a Group on a Folder. This matrix is very powerful and visible. As you can see in the previous screen-capture. This feature is disabled by default and is unsecure but it may be helpful. Its aim is to permit the Users of a Group to have the right to edit/modify all Items they have access to. It will bypass the settings set for each Item. Only activate this for a Group with limited Users. To activate this, click on the icon as shown in next screen-capture. Creation, modification and deletion can only be performed by an Administrator or a Manager. The Manager will only see the Group that he is associated to. 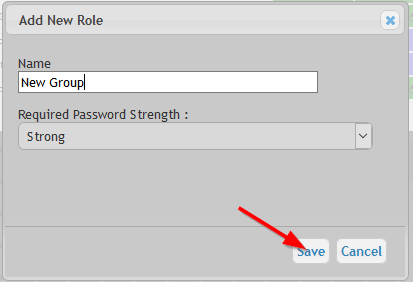 Deleting a User Group will not delete the associated Users.